Advocates are mounting a fight to end the other death penalty—life without the possibility of parole. These “hidden death sentences” mean prisoners must live the rest of their lives in “prisons with extraordinarily high suicide rates, with substandard medical, dental, and mental health care and with scant rehabilitative programs. Prisons rife with gang violence, racism, and despair,” said Kenneth Hartman in a Truthout article. Hartman was recently released from a life without possibility of parole sentence by the California Parole Board, which approves or disapproves commutations. A sentence of life without the possibility of parole, known as LWOP, translates to staying in prison until you die and, some argue, wastes resources. Ashley Nellis, senior research analyst at The Sentencing Project, a nonprofit research and advocacy center, said this in Still Life: America’s Increasing Use of Life and Long-Term Sentences (2016). LWOP terms have quadrupled since 1992 despite a historically low crime rate and falling prison populations, according to research. Evidence shows Blacks receive such sentences dis- proportionately. Blacks make up two-thirds or more of the LWOP population in Alabama, Illinois, Georgia, Louisiana, Maryland, Michigan, Mississippi, New Jersey and South Carolina. Also, half of all LWOPs are held in Florida, Pennsylvania, California, Louisiana and the Federal prison system, according to Truthout. Moreover, in 2016, 53,290 or 1 in 28 incarcerated people were serving LWOP sentences. The push to end LWOP sentences has increased. “There has definitely been more advocacy on LWOP in the past five years,” Pennsylvania activist Ellen Melchiondo told Truthout. Melchiondo was responding to United States Supreme Court rulings against juveniles receiving LWOP sentences, outcries about the cost for taking care of incarcerated seniors, and more engagement in fighting against LWOP sentences. Ultimately the Supreme Court ruled that “sentencing juveniles convicted of non-homicidal crimes to life without the possibility of parole was unconstitutional,” and stated no juvenile could receive a life without parole sentence for any homicide without consideration of his or her age, according to Truthout. “States can remedy the un- constitutionality of mandatory juvenile life without parole sentences by permitting parole hearings rather than resentencing the approximately 2,100 people whose life sentences were issued mandatorily,” said a 2017 Sentencing Project report cited in the Truthout article. Additionally, the Coalition to Abolish Death by Incarceration, which includes several other organizations, has gained media attention with its rallies against LWOP in Pennsylvania. California Governor Jerry Brown has reduced at least 42 LWOP sentences to 25 years to life with the possibility of parole. 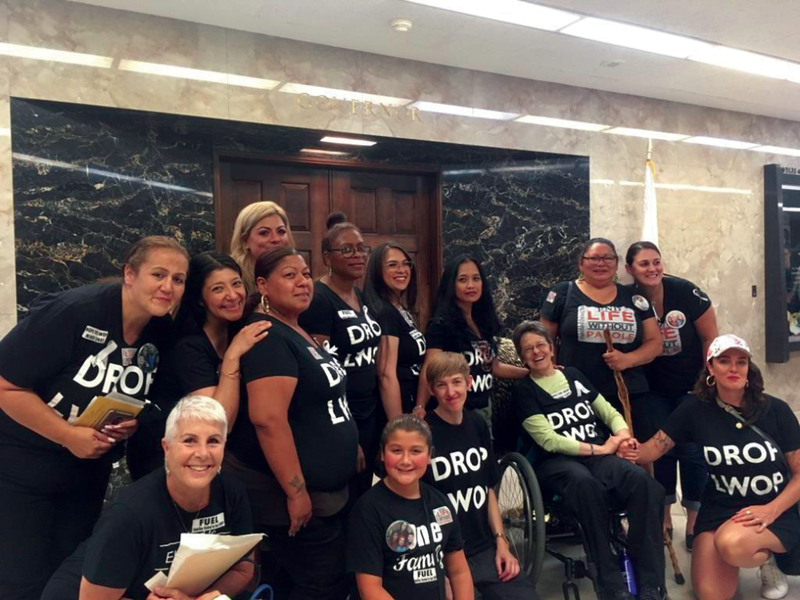 Lizzy Stewart, mother of an inmate, garnered 57,000 sig- natures to get her son’s LWOP sentence commuted in California, according to Truthout. Back in 1913, a life sentence in the federal system was 15 years, according to Marie Gottschalk in a Prison Legal News article. In 1972, the United States Supreme Court abolished the death penalty and many states responded with LWOP sentences, according to the Prison Legal News article cited in Truthout. The Supreme Court ruling in 1976 reinstated the death penalty, according to the Death Penalty Information Center. Thereafter, a sentence of life without the penalty of parole became the normal default. Hartman, who had an LWOP sentence until a commutation led to his release, points out that those who seek to abolish the death penalty shouldn’t settle for LWOP in its place. “They believe we should trade the death penalty for [life without parole],” Hartman said. He believes a reduction to a LWOP sentence does nothing but change the method of execution to death by incarceration. Hartman, freed in December 2017, and organizations continue to advocate against LWOP. Hartman released an anthology written by people serving LWOP called, “Too Cruel, Not Unusual Enough.” He’s handed the book out to key people like policymakers, judges and death penalty abolitionists, according to the Truthout article. “This is clearly a growing campaign/movement—it was beautiful, powerful and filled with emotion,” Pam Fadem of CCWP said about the trip to the state’s capitol.